Leave it to Southern California to take an American classic, add a new twist, and turn it into something new and exciting. That kind of ingenuity can be seen in the way the residents of The Golden State dress, how they interact, the booming entertainment industry, and even LA's luxury apartments. It might seem strange to note, but Angelenos' ability to put their own spin on just about anything under the sun even extends to activities like the much beloved Turkey Trot. If you're heading out for Turkey Trot LA this year, you'll do well to observe that it'll be a fair bit more invigorating than any you've witnessed before. What In The World Is A Turkey Trot? Perhaps you've never heard of a Turkey Trot before? In short, it's a kind of long-distance run (typically ranging from 3-10 miles) traditionally held on (or nearabouts) Thanksgiving, with the reasoning being to burn off the calories that will surely be gained from dining on large Turkey day feasts. In the modern day, they're also used as a way to bring the community together and get involved in fundraising for charities and volunteering for the needy. It might surprise you to find out that Turkey Trots are the "oldest continuous footrace" in the US, and one of the Nation's most popular races to boot. The first Turkey Trot was held in the late 1800s (the Buffalo Turket Trot, held each year by the YMCA since 1896), and today there are hundreds such events held across the country. There are plenty of variations on the theme. Sometimes, runners might don some sort of Turkey outfit to signify the day; they might even be a kind of "prediction race," where runners anticipate what time they will finish in, and the winner scores themselves a sumptuous turkey dinner courtesy of the race organizers. By and large, these are enormously fun events, a chance for people to come together for some Thanksgiving-themed levity. Of course, in Los Angeles, residents take it to the next level by giving it all they've got. Here's what you'll need to know. First the obligatory details. The LA Turkey Trot will begin 8AM sharp, Pacific Time. The course starts and finishes in front of City Hall (that's 200 North Spring Street, if you weren't already aware), and all are welcome to participate (you'll need to get your packet at 6:45AM on race day, though, so be prompt). "Can we say fast, fun and scenic? The race starts in front of City Hall and loops up and around Grand Park, past Disney Hall and Cathedral of Our Lady of the Angels. After a nice downhill, participants will be treated to a historic course along Spring Street, referred to as the Wall Street of the West." "Like doing 5ks and want to go longer? Then do the 10k. The course does portions of the 5k with added mileage on Grand, Hope, Olive and Lower Grand. You’ll get to see the new Broad Museum and other sides of Disney Hall and Dorothy Chandler. The race starts in front of City Hall and loops up and around Grand Park, past Disney Hall and Cathedral of Our Lady of the Angels." Those landmarks include notables like the Continental Building, The Hellman Building, The El Dorado Hotel, etc. If the sights you'll see on the run aren't enough to get you going, the prizes will surely be enough to sweeten the pot. Every participant in the race gets a nice "I HEART LA Race Package," which includes a soft cotton Turkey Trot LA T-Shirt. Those that finish the not-so-grueling race will also get a finishers, and the 1st, 2nd, and 3rd place finishers from various categories will be awarded with special medals according to how they placed. There's also a good deal of race-day "swag" available for purchase, including Bombas Socks and a range of fun graphic tees. Purchasing a pair of socks will be like getting a gift for yourself and someone else, since the organizers of the run will be donating a pair of socks (along with six bucks) to Midnight Mission for every pair bought. Midnight Mission, by the way, is a noted charity that helps the homeless and impoverished, so you'll be doing some good for the community by simply participating in the race day fun and putting down a few dollars on some socks. Donate directly to the Midnight Mission (donations will go toward entry into a special raffle). 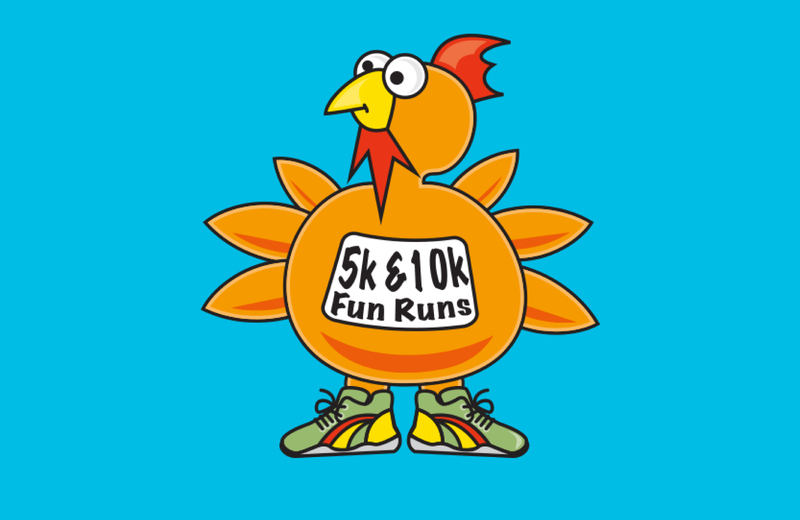 Purchase a Turkey Trot LA Button. Bring blankets and toothbrushes for the needy. Volunteer your time with the Midnight Mission (every helping hand is appreciated). "Volunteers are integral and crucial elements in making our events viable. Volunteer tasks include, among others: providing water and food, keeping runners on course, cheering runners on, keeping spirits up and making the race safer for everyone." Need more proof that Turkey Trot LA is one of the finest around? Check out some of the photos from past years (this will be Turkey Trot LA's fifth) or head on over to the Facebook Page to see what past participants have been saying about the wonderful time they had in attendance. You'll reach the obvious conclusion: the Turkey Trot is not an event to be missed. The Turkey Trot ends at 12:00PM, and there's plenty more Thanksgiving to get into afterward. The pristine arrangements at Eighth & Grand provide the perfect place to host for your intimate Thanksgiving get-together. Nestled within the heart of the new and improved DTLA, this top-tier rental community has much to offer. Gorgeous living spaces, fabulously upscale amenities, and a sense of togetherness you'll not find in many other apartments around the city. Consider this your top pick for downtown living, West Coast style.